MSAHLI S1. SAKLY F1. EL OUDIANI A1. DREAN J. Y2. This work aims to investigate the inter plant variability in agave fiber physical and mechanical properties. Using Design of experiments techniques, some parameters were defined and considered as controlling factors. These parameters are related to the fiber collecting mode, namely the choice of the plant, the leaf and the position of the fiber in the leaf (fiber maturity) . The main results show that the factor â€˜positionâ€™ has a highly significant effect on the different studied characteristics except for the initial modulus. This means that fibers located at different positions in the leaf (tip, middle or base) exhibit different properties. On the contrary, the factor â€˜leafâ€™ remains the more negligible for most characteristics. Furthermore, it was noted that the effect of factor â€˜plantâ€™ is highly significant for mechanical properties but negligible for fineness and diameter parameters. . The main problem in dyeing with reactive dyes is low affinity caused by existing repulsion forces between electronegative charges in both cellulose fiber and reactive dyestuff. To overcome these forces in dyeing processes, a large amount of electrolyte is needed, which is economically and ecologically unfavorable. Substantial remedies are being considered within the textile processing sector to reduce the effluent pollution and to fulfill the environmental regulations. In this work, plasma-nano chitosan treatment as an environmentally friendly method was employed to modify surface properties of cotton fabric to develop salt free reactive dyeing. Plasma treated cotton surface characteristics were evaluated using FTIR. The surface activation using air plasma introduce different oxygen-containing polar functional groups such as C-O, C=O, and O-C=O in cotton fabric. Cotton surface functionalized by chitosan nanoparticles had evaluated using electrokinetic (zeta) potential measurement. The effect of atmospheric plasma and chitosan nanoparticles in color strength (K/S value), color fastness of the dyed fabric was investigated. The cotton fabric treated with plasma-nano chitosan had higher K/S values. The effluent showed reductions of total dissolved solids (TDS) content in salt free dyeing..
GARGOUBI S1. LADHARI N1. BOUDOUKHANE C3. MECHRI B2. HAMMAMI M2. SAKLY F1. Since ancient times, dyes derived from natural sources have been used for dyeing textile fabrics. During last few decades, Environmental awareness in the production and application of synthetic dyes revived interest in natural ones. 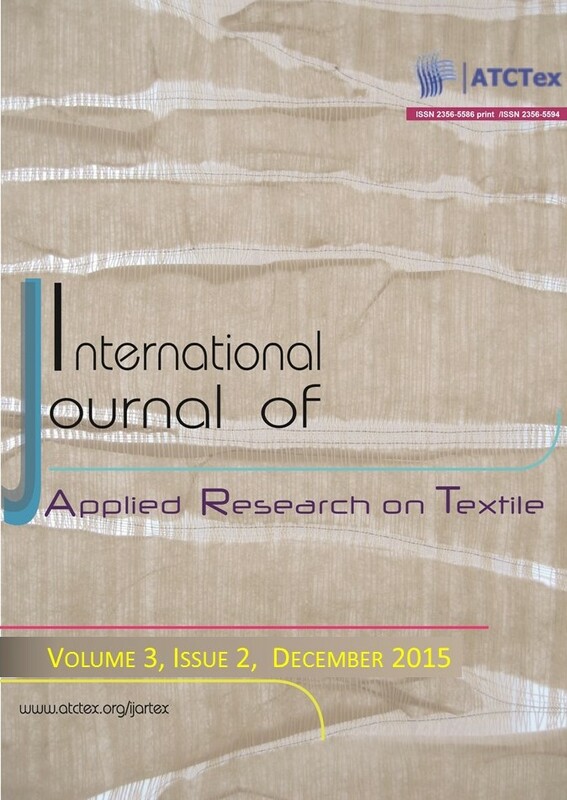 This work aims the investigation of Tunisian populations of Rhus Tripartita for textile dyeing. The extraction method using Soxhlet extractor yields a highly concentrated dye. The various parameters that may affect the dyeing process were investigated. It was found that pH and temperature of dyeing influence considerably the results. Quality control of all dyeing was performed using standard fastness tests and colour measurements. The results were promising for Rhus tripartita extract as a natural dye. .
ABID K1. DHOUIB S1. TRIKI A2. SAKLY F1. Our aim in this paper is to study the dielectric properties of fabrics when we apply nanocomposites coatings. The used clay for manufacturing of the nanocomposites is a cheap natural Tunisian product consisting of different kinds of clays, more precisely dolomite, kaolinite, illite, calcite, and quartz. This clay has gone through the following processes: cleaning, purification, and drying. Then a polyacrylate resin (also used in the textile industry for many applications) has been added. Several clay/resin mixtures were used to coat samples from a pure cotton fabric (200 g/mÃ‚Â² sergey). We then measured the electric capacitances of these coated fabrics using a domestically assembled capacitor instrument. This showed a variation in the electric permittivity of the differently coated samples. The main finding was that the more nanocomposites deposited the more important is the electric insulation..
HASAN T. H1. EL ARABI S. M1. Composite materials are getting more attention worldwide because of their good mechanical properties and light weight and having diverse applications. Textile composite materials are materials where a textile material is used to reinforce a resin, mainly polymeric resins. Glass, carbon, and Kevlar are commonly used textile materials for fabrication of composite materials. One of the factors affecting the performance of these materials is the way that the material and the resin are brought together, which is known as the bonding adhesion. This article determines this factor by studying the internal bonding and the effect of the number of layers and the type of the textile fibre used. The tensile strength and the elasticity were also measured. The conclusion of this work had shown that glass fibre had better adhesion properties than carbon fibre when used to reinforce epoxy polymer. .
MAATOUK I1. MSAHLI S1. ZIDI M2. SAKLY F1. The target of the research was to establish dependency relationships between certain factors (such as tension value, torsion value and filament number) and the yarn bending expressed by the orientation of the central filament spatial angle. Statistical experimental design was used to optimize polyamide yarn bending phenomenon during spinning for a series of models varying in the tension value, twist value and filament number. The twist behaviour of the multifilament is simulated by using the ABAQUS finite element package and modelling the yarns as 3D continuum elements..